On May 21, 2005 I met with Touma at a coffee shop in Tokyo and conducted an interview through his interpreter, Koto Nishiyama. Due to the language barrier, Koto translated my questions and Touma’s responses. The following was reconstructed with a tape recording of the interview. Touma -- well-known for many of his popular toy designs including the Knuckle Bear, Talons, Snout and most recently Hell Hounds -- was very friendly and was eager to discuss his work with his fans in the United States. Be sure to click the photos for larger images and to see the video! Francine and ToumaQ: Do you have any formal training such as a degree in art or design? Yes, I went to a 4 year school and have a degree in 2D art specializing in visual design. In school I did a lot of poster art for advertisments. Q: Do you collect toys? If so, which ones? (Laugh) Yes, I do. I collect Lego and Playmobil. I like small toys which have very simple designs and forms, nothing too complicated. Q: How about vintage toys? Yes, I like the old school Lego. I like the ones with simple facial expression. I don’t like the present day Lego with different characters (faces), such as Star Wars. I like the ones with simple forms. Q: How did your work at Sega influence or prepare you for your career in toy design? At Sega I worked with many people creating different characters for a game, so I was exposed to various art forms. In designing games, I create worlds to fit each individual character to form a storyline. 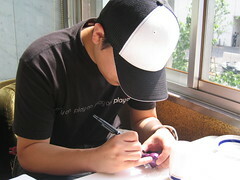 At Sega I developed the skills to design many different kinds of characters, such as monsters, gods, heroes, villains. With popular movies like Lord of the Rings and Harry Potter, the entertainment industry is capitalizing on the fact that these movies are well liked and so they make toys from the characters of the movies. I wanted to work with that same idea, bringing characters from games I create into the toy world, that way it is exposed to a greater group of people. Q: Would you say that games serve as your inspiration? 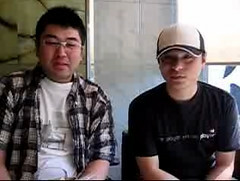 When I was at Sega, I was on a project to create a role playing game but that never became reality. I created many creatures for that project and that sometimes helps inspire my creative process. Q: Is there a particular artist you admire, that you look at for inspiration? I like a lot of artists, but I particularly like the work of Tim Burton and Tim Biskup. I like their style. I like their simple designs. I really like the drawings of the artist who draws the animated Batman, I like his simple lines. But I try to create my own designs, I always encourage myself to create special designs. Signing a Purple Knuckle BearQ: How would you describe your art/design style? I tend to keep things as simple as possible. I try to create toys that young children like, which means toys that are simple, cute and cool. I have 2 young children and their opinions of my designs are an important element of my creative process. My daughter often sneaks into my office at home and takes a peek at my designs. If she tells me it is too scary, I try to soften it up a bit. An important aspect of my design is that the toy must be something I would buy myself. If I feel it is something I would spend money on, then it is a good design. If it is something I would buy for my children, it is also a good design. Q: What motivated you to design toys? Was it a quick process to get started or a longer journey? The first process is to do a quick drawing and advance to making the initial figure without any alterations. Of course I will then prefect the figure as I cast it. Working with a client requires a different approach. I will have multiple designs and the client will help me by making adjustments to the drawing until the figure is acceptable. Then a mold is made for mass production. There are times when I get really creative and start drawing a bunch of designs, which I usually keep to myself for future reference. Q: Do you make your toys yourself? I usually make a prototype of a toy to be used as a sample for the factory for mass production. 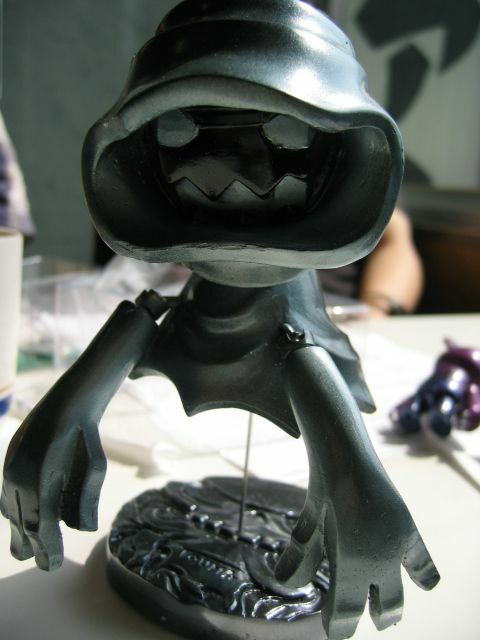 However, I also hand cast certain toys but of course these kind of toys are very limited, usually I only make about 10. Q: The first toy I remember seeing of yours was the Talon, then came the Knuckle Bear, Fang Wolf, and the most recent Hellhounds. Each of them were well received but is it fair to say it was the Knuckle Bear that “brought” you into the toy design world? Why? Before Knuckle Bear, I designed other toys but it was Knuckle Bear that jump-started my career in toy design. In reality Knuckle Bear came out before Talon but they were only sold in Japan through a store call Spanky. When it sold well, Spanky and StrangeCo got together to produce Talons, which was my first toy to be sold in the United States. That is probably why most people in the US think Talons came before Knuckle Bear. However, Knuckle Bear sold much better than the Talons and became more popular in the United States than Japan. Q: Why do you think Knuckle Bear is so popular? I don’t know why Knuckle Bear is so popular. When I was making the first bunch, Raymond of Toy2R didn’t think it was going to sell, so we only made 300. It didn’t sell like crazy but it sold. So the second time, when I was making the waver versions, I used very eye catching colors, and that sold very well. I think the designs were very intriguing and maybe that is why it is popular. In Japan we have many cute bear characters but none of them was as well received as the Knuckle Bear. I work at my studio at home most of the time. I don’t get out much and since I don’t understand English to read the discussion boards, I don’t know how my toys are doing in the United States. I am very happy that they are so well received in the United States. Q: I think it’s safe to say that you are known in America primarily for your toy designs rather than say drawings or canvas art. Have you ever exhibited your art work at a gallery or other “show” venue? In Japan it is very different to hold an exhibition. You have to be a famous artist in order to have a solo show. Nowadays I do mostly 3D art, I haven’t done 2D art for a long time. Besides, there are so many good artists that do 2D art, like Tim Biskup, I cannot compare myself to them, so I rather leave 2D art to the experts. Q: Which of your many characters is your favorite and why? That is hard, it is like choosing your favorite child. My favorite was the Fhantom but I have to be fair since Knuckle Bear did a lot for me. He brought me income and recognition. I think Knuckle Bear would have to be my favorite now. Ghost - Monster Material Q: The answer to this question might be on your website but unfortunately I can’t read it since it’s in Japanese. You have a page with a list of interesting characters, some of which you have made into toys. Could please tell me more about those characters? Do you plan to make them into toys? Is there a storyline involving these characters? I am working on new material for the website and when it is done, it will be translated into English. On my current website, you can find a series of characters in the gallery. Each character comes with an explanation of who they are. They belong to a world I have created but I have not completed the storyline linking all the characters together. I have already released two toys from that world, first the Skull and now the Ghost, but it is still a work in progress. Q: There are many pictures of your “Fhantom” toys -- a cute zipper-guy design -- on your website. While it appears that these toys have been around for several years, I have never seen these in the United States. Can you tell us more about them? Are they still being produced? Where can collectors buy these great-looking toys? (Laugh) That’s because nobody sells them. I made Fhantom when I was just starting out in my toy design career. I made them in Japan and due to the high production cost, I had to limit the quantity. They were only 10cm tall and cost roughly around $35 to $40. I think that is too expensive to ask toy collectors to spend. I made the decision not to sell them overseas and they weren’t even sold in Japanese stores. I sold them myself. If there is a need, I might bring a few pieces I still own to Comic-Con (San Diego). Q: You seem to have a very special and long-lasting relationship with Toy2R, from your first Qees to your recent signing at Yoyamart in NY. How was that relationship developed? The meeting was very accidental. I was exhibiting at a design show for upcoming artists. Raymond and the president of Wonderwall were to attend the toy show which was being held in at the same location. The president of Wonderwall was late and so Raymond had some time to spare. He ventured to the design show and we met for the very first time there. He contacted me later and expressed his interest in producing my toys. I think it was meant to be. Q: What’s your opinion of the recent surge in popularity of vinyl toys in the United States? Vinyl toys are getting very popular in the United States and Europe, there are many great artists in the West to help drive the popularity along. Just like what Michael Lau did for Asia, Japan needs new artists to develop new designs to super charge the vinyl toy craze. In Japan, we are always using the same artist to make toys because the companies would only want to deal with someone who is famous. If you are unknown, they don’t even bother with you even if you have a cool design. Japanese culture is very tough on artists. I am probably more known in the West than in Japan. In the United States, you have Tim Biskup, Gary Baseman, Kozik and Dalek, they are constantly coming out with new art and new toys, which makes the market very exciting. However, they are unknown in Japan and therefore it is difficult for them to excite the Japanese market. Q: The Zero Hell Hound just came out in the US and many stores sold out in days. My understanding is that Light Blue Zero and Eins are being produced in very limited quantities with most reserved for Japan. Why are these figures so limited? Hell Hounds are also sold out in Japan too. I wasn’t prepared with the demand. Light Blue Zero and Eins are only sold in Japan because they are store limited edition. Zero and Eins are brothers, Eins means No.One in German. I am not sure if there is going to be a No.2. Light Blue Zero is E-MiniStop.com limited and Eins is Pook et Koop limited. I was told they all have been pre-ordered and sold out. Toy2R may have some to sell to the United States. I was very surprised with the reaction I received with Hell Hound. I must say I was very relieved to see it being so welcomed. It took me almost a year to develop Hell Hound with Toy2R. It was a long and difficult year but I am now much happier knowing it is doing so well. Q: Any plans to produce toy designs for other designers’ toy “canvases”? A Touma Dunny would be quite nice? I would love to do a Dunny. I want everyone to be happy. Q: What’s next for Touma? Would you like to share details about upcoming toys or shows? What are your plans at Comic-Con? Any exclusive items? Touma Speaks to his Fans (video)I am working on three vinyl toys currently. They are going to be very cute. I can’t discuss too much about this new toy. But I will be at Comic-Con on July 13th, 14th and 15th. I will be signing at Toy2R’s booth on the 14th at 3:00pm. I will also be signing on the 14th and 15th at noon at the Circus Punks booth. I will have some custom Hell Hounds for sale and of course, I will be signing the white Hell Hounds just as I did in New York a few months ago. After the interview, Touma graciously signed my Chapter 2 chase (purple) Knuckle Bear I had taken with me to Japan. He also told me it is his desire one day to relocate to the United States. We then visited a store at Nakano Broadway call One-Up. I'll post a small write up complete with pictures about One-Up soon. He Did a wonderful train for our show in NY. Awesome interview! We met Touma in NY, but didn't have a translator unfortunately. His drawing for us spoke a thousand words though. I have to agree with Klim, Touma is one of the good ones! Anybody else going to try and buy a Fhantom from Touma at SDCC? I love these little zipper dudes! what a nice vivid interview!!! i just hope that japan will finally start to pick up his hot tracks! keep it up, touma and i hope to see you AGAIN this summer in SD... don't you ever get sick of me??? oh yeah, one-up's an awesome shop as i bought a few hidden gems there recently!